It's a Friday, and it's been a little while since I've posted and a long while since I've posted a Friday Grab Bag. After all we've been through, it's spring finally and beautiful in Massachusetts today. This leads me to think that some random thoughts on random topics with no discernible thread is what people need. So, here goes. Friday philosophy (complete with a dead body). Think about this sentence for a minute: "Police confirmed yesterday that the body found floating in the river belonged to Sally Jones, a sophomore at the local community college who had been missing since last Friday." While this sentence is made-up, it nevertheless could appear in a newspaper article reporting on an ongoing investigation. What's interesting to me is this -- what can it mean for a corpse to "belong" to someone? It makes no sense. The body is not in my opinion distinguishable from the "self" and furthermore, even if it is, the "self" referred to in the sentence is dead, and therefore no longer able to own anything. This is a case of Miss Marple meeting Rene Descartes and the offspring not being too pretty. Long before Marc Antony, Cleopatra was intrigued by Julius Caesar who was in the process of installing himself as the first emperor of Rome. Cleopatra wanted to meet Caesar but going to Rome overtly would have been a complicated issue politically, so she opted for another method -- clandestinely. Of course she would travel by ship, but how could she be on the ship without being spotted? Her answer was to go to Rome rolled up in a carpet, a carpet that would be delivered to Caesar as a gift, and which when unrolled would produce this woman, the queen of Egypt. A fabulous story, though it is hard to imagine what the travel accommodations were like. Note: Wikipedia fills out the story wonderfully and dramatically and gives a much more accurate telling of this story, correcting my bad information, such as -- this happened in Alexandria, Egypt not in Rome, and Cleopatra sought Caesar as a trump card in her power struggle with her brother Ptolemy. The fact that she had Caesar's child 9 months after the "carpet encounter" is an interesting fact too, as is the source of this tale, Plutarch. 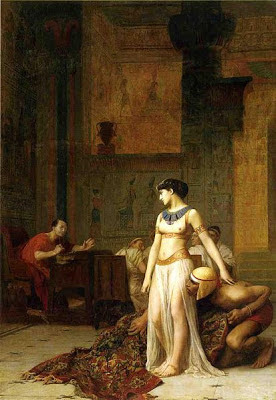 Of course there have been many images made of Cleopatra over the centuries, so pivotal is her story to our imaginations. Cleopatra meets Julius Caesar. French, Jean-Leon Gerome, ~1867.